Once the most popular social network for college students and teens, Facebook has become more like a public forum for moms, dads and grandparents to embarrass their family members. If you're wondering why "the kids" prefer Instagram, Tumblr and SnapChat over Facebook, it might be because of status updates like these. 1 Your parents (and your parents' parents) are now on Facebook -- and they're on to you. 2 From now on, your mom always gets the last laugh. 3 You can't post cryptic messages or song lyrics without being called out. 4 Your friend's dirty joke? Now it's your mom's dirty joke. 5 Your dad thinks he's hilarious (and he really is). 6 Your mom makes fun of you too (although unintentionally). 7 Your not-so-subtle flirting attempts attract the one person you don't want to see them. 8 ...And your negative statuses just upset grandma. 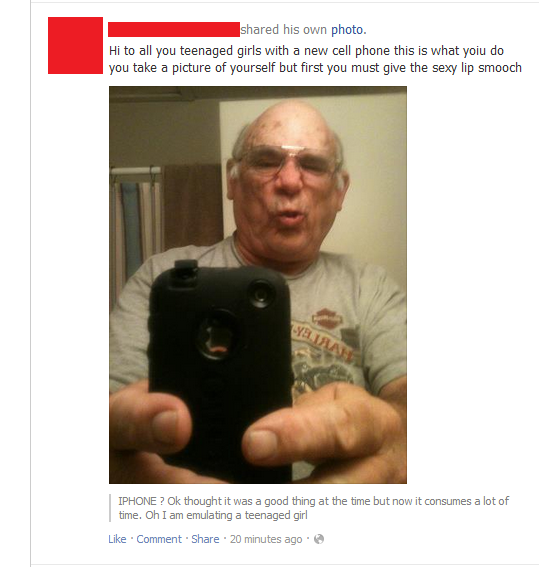 9 Your dad's status updates require serious assistance. 11 ...But she hasn't quite mastered the abbreviated lingo. 12 Your dad feels comfortable displaying his love of puns AND your family's personal business on your wall. 13 You can't get away with ridiculous user names anymore. 14 Soon enough you'll realize you aren't the favorite child. 15 ... And that Grandpa's a perv. 16 ...And that your dad can entertain your friends better than you can. 17 Let's just hope mom doesn't join Instagram anytime soon. Certainly the hottest new social network, Pinterest doesn't have all the functions and features of Facebook quite yet -- basically, you're just posting photos to your different boards, which you can categorize by interest or hobby or whatever. You can also follow your friends' boards and comment on their pins. And that's it. Pinterest is a simple, visual concept that has a huge, vibrant community of active users. It <a href="http://techcrunch.com/2012/02/07/pinterest-monthly-uniques/" target="_hplink">hit 10 million users faster</a> than any other social network and is now the <a href="https://www.huffpost.com/entry/pinterest-traffic-growth_n_1408088" target="_hplink">third most popular social network</a> in America, trailing only Facebook and Twitter. <br> <br> You can <a href="http://pinterest.com/" target="_hplink">request an invitation to join Pinterest here</a>.